1. 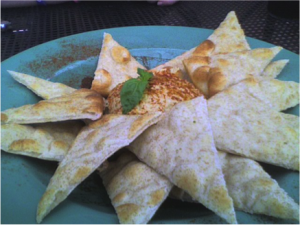 With scissors, cut pita rounds into 6 triangles then separate the layers. 2. Arrange on a baking sheet and spray with oil. 3. Mix Parmesan cheese and garlic powder together and then sprinkle over pitas. Bake at 300F for 15 minutes or until crisp and golden.